When I started this blog almost two years ago, one of the many ideas behind it was to have it function as a kind of outlet for my various musings on films and television. I wanted to write about these things, but did not want to contribute to the latest volume of "That's What She Said: Philosophy and Gender in The Office." Today, I have effectively broken that little rule, and have proposed the following for a book on The Wire. Given that this blog is usually the outlet for these thoughts I thought that I would post it here as well. In The Wire the illegal drug trade function as a sustained allegory of capitalism. It is at once the outside of the world of legitimate business, governed by different rules and principles of loyalty, and the former’s dark mirror, revealing the effects of a relentless pursuit of profit on the community and lives of those caught up in its grip. Nowhere is this tension between “the game,” the drug trade, and the larger game of capital illustrated with greater clarity than in the life and death of Russell “Stringer” Bell. Bell is often presented as the character most enamored of the legitimate world of business, taking economics classes at community college and applying the lessons to the world of the drug trade. Bell is also presented as the character who desires not only wealth, but the legitimacy of the world of legal business. His story functions as a brutal and tragic retelling of the classic Horatio Alger story, a “by the bootstraps” “rags to riches” story in which murder, addiction, and betrayal are as fundamental as hard work and business acumen. 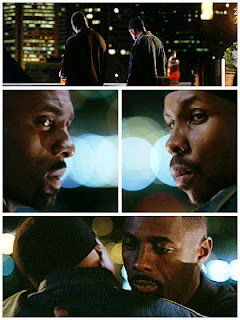 It is story that ends tragically as well, while Stringer Bell is able to accumulate money, he is unable to acquire security and legitimacy, he remains caught between the “semi-feudal” loyalties of the drug trade and the ruthless world of capital until the contradictions between the two eventually kill him. Bell’s trajectory is best understood as a variation of what Marx referred to as “primitive accumulation.” Marx’s chapters in Capital on primitive, or so-called primitive accumulation, make two separate but related arguments. First, Marx counters the account of the formation of capital provided by political economy, an account that is presented as a moral tale dividing the thrifty from the wasteful. It is the original template for all Horatio Alger stories. Second, Marx provides his own historical account of the emergence of capitalism from feudalism, an account in which violence is an indispensable element. What is at stake in Marx’s theory (and in the works of such theorists as Althusser, Deleuze, and Negri that have developed these ideas) is less a matter of distinguishing between a positive or negative account of capitalism, in which capital is seen as either moral or immoral, than of working through the complex intersection of morality, desire, narrative, and violence that is at stake in life under capitalism. Capitalism cannot be separated from its narratives that equate financial worth and moral worth, as much as it continually undermines these narratives in practice. It seems wrong to write about Stringer Bell without including a picture.